Once again thanks for the episode. And thanks to Laminar for giving Jack and all of us a view into just a small part of what we can enjoy as a small but wonderful part of GA.
For those of us who fly non-electric, and therefor inherently safer and more reliable aircraft, the mag check is for several purposes. Yes we want to ensure that both mags and all plugs are clean and working properly, but the real issue is that the P-leads are intact, and that when the mags are off, the mags are off. Some of us have to handle the prop as part of the starting procedure, and a busted P-lead can turn an otherwise simple procedure into an ugly mess. So if as the day progresses, and we know the engine is running clean and strong, and we only do a simple mag check to ensure that the P-leads are correct while taxiing or on take off, forgive us the "shortcut" and realize we know whose hands will be on the prop, and who it is that really cares. And Jack, if you do ever make it out to the great and wild North West, you have many friends, and we will make sure you see just some of what you are missing. Last night I was talking to a person that has time in a 172 on floats out of KRNT (Renton WA) and I asked him about how long the run up took. He said that the checklist is very short and it hardly takes any time at all even if you are slow and methodical about it. He also said that you are not on the step and slogging through the water at that point so you don't go very far. My question is when is Jack going to buy a cub? Sheesh, after that story I have started trying to convince my wife that I (uh I mean we) need to get a little two seat tail dragger... Hasn't worked yet, but I am still trying. From a listener, by way of Jeb, here's another angle on the hanging 152. That may have been the world's record for the tightest inside loop. Glad they were OK. 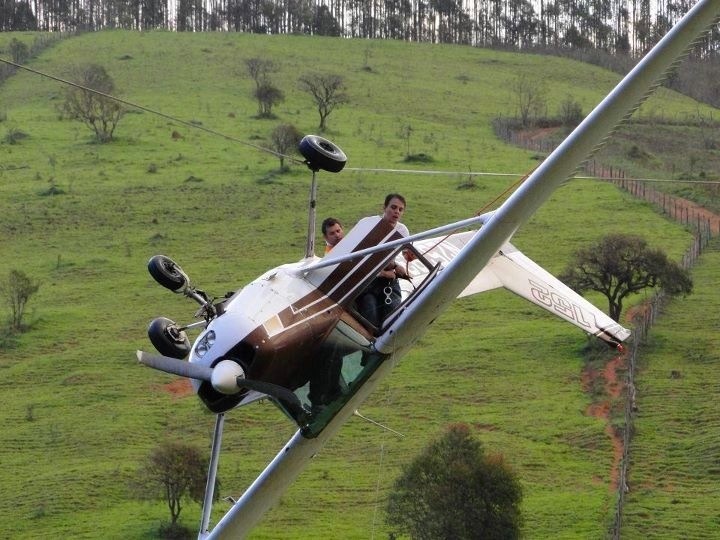 I'm curious what the thought process was that made them apparently try to climb out of the aircraft. How did they expect that would improve their circumstances? I can only imagine a host of ways it could have gotten worse. There is a gizmo on the guy's belt that looks like part of the hardware mountain climbers and rescue folks use in rappeling. I think the picture was taken from the basket about to be used in the rescue, which is the easy part of why nobody got hurt. The hard part was indeed, the off field landing. It looks like he is holding a line as well. I thought that repelling gear looked like a pair of handcuffs at first. The plane looks like it has an N number, too. I thought that this had taken place in Central or South America somewhere. As I understand it, there are many "N" registered aircraft operating in other countries. Europe has a bunch, so not surprising that they are south of the border also.